SAN DIEGO -- Family members of the grandmother fatally stabbed in Otay Mesa say the justice system failed them. "Everybody is devastated. This is a horrible tragedy," said Christina Praml. Praml is one of Donna Chatterfield's six grandchildren. She lives in Washington State, but talked to 10News over the phone Tuesday evening. "She loved Raymond just like her own child. She took care of him from newborn all the way up," said Praml. 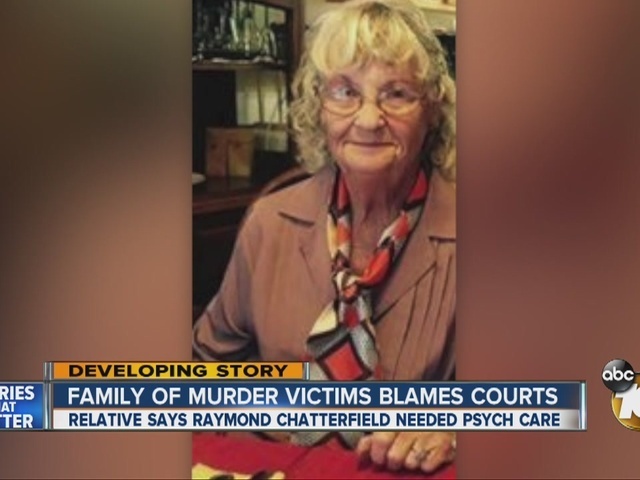 Raymond Chatterfield, 29, is accused of fatally stabbing his 78-year-old grandmother and his uncle, Kenneth Chatterfield, in their home at the Rancho Chula Vista mobile home Park Monday afternoon. Raymond had been released from jail just hours before the murders. "I really feel like the justice system failed us. If the judges would have done a mental evaluation and put him into a hospital I don't feel like none of this would have ever happened," said Praml. She said Raymond has a history of mental illness and drug abuse. Her grandmother filed restraining orders against him and had resorted to calling police when Raymond, who was homeless, showed up. "She tried to get him help several times, and she felt like it was a losing battle so she just started calling the officers out and they just started putting him in and out of jail," said Praml. Donna Chatterfield was a mom of four, grandma of six, great-grandma of five, and a great-great-grandma of two. "She was just a wonderful lady and she would have done anything and everything for her family. She never judged one of us for anything because everyone makes mistakes," said Praml. Praml said Donna also struggled to afford Raymond's medication and when he refused to take it, he became violent. "Grandma couldn't afford his meds, so she tried to get him medical stuff, this was before Obamacare came in," said Praml. She referred to her grandmother as her "sunshine," but said she doesn't want to see Raymond go to prison. "I feel like he should go into a hospital for the rest of his life. I don't know if prison would do him any good." The family set up a GoFundMe account to help pay for funeral expenses.